Goal! 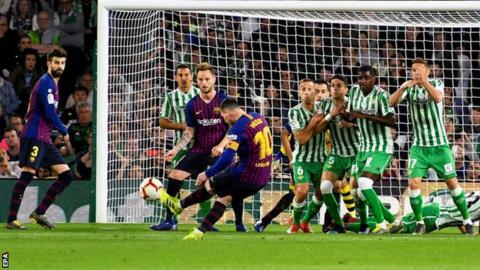 Real Betis 1, Barcelona 4. Lionel Messi (Barcelona) left footed shot from the left side of the box to the high centre of the goal. Assisted by Ivan Rakitic. Attempt missed. Ivan Rakitic (Barcelona) right footed shot from outside the box is high and wide to the right. Assisted by Lionel Messi following a corner.